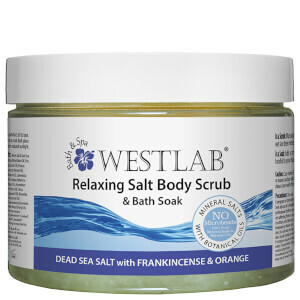 Gently exfoliate with the Detox Himalayan Salt Body Scrub from Westlab. Infused with a blend of essential oils, including juniper berry, grapefruit, refreshing spearmint and invigorating rosemary, the beneficial formula helps to reduce water retention and stimulate circulation. Apricot, rice bran and antioxidant vitamin E work in unison to boost elasticity, protect and repair skin, and provide anti-inflammatory properties, whilst softening and regenerating the body. Delivers an uplifting fragrance and buffs away dead, dull skin cells to leave you feeling revitalised, detoxified and deeply cleansed. E.N. Massage gently in circular movements onto damp skin, then rinse off. 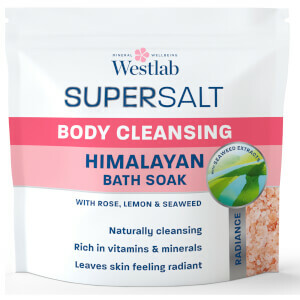 Sodium Chloride (Himalayan Salt), Orysa Sativa (Rice) Bran Oil, Vitis Vinifera (Grape) Seed Oil, Prunus Armeniaca (Apricot) Kernel Oil, Tocopherol (Vitamin E), Cedrus Atlantica (Cedarwood) Bark Oil , Citrus Grandis (Grapefruit) Peel Oil, Anthemus Graveolens (Dill) Oil, Rosemarinus Officinalis (Rosemary) Leaf Oil, Juniperus Communis (Juniper Berry) Fruit Oil , Mentha Viridis (Spearmint) Leaf Oil, Cymbopogon Schoenanthus (Lemongrass) Oil, Limonene*, Linalool*, Citral*, Geraniol* *naturally occurring in essential oils.